Divorcing a narcissist? You are probably left feeling baffled and shaken by the communication that you receive from the narcissist. In my mid-twenties, I contemplated learning multiple foreign languages. I envisioned dabbling in French to successfully make my way around Paris or Irish Gaelic to explore the rich history of Ireland along with my deep ancestral roots in that country. My day dreams about learning new languages always went hand in hand with the imagery of world travel. The thought of exploring exotic and old world places far away from home intrigued me. My mind summoned several foreign adventures, but never did I think I would need to learn a foreign language to navigate my own life. In 2008, I heard the words, “Narcissistic Personality Disorder” (NPD) to describe my then-husband, Seth. It took a couple years for the reality of those three little words to really sink in. Looking back, the red flags had been waving in the wind since our very first date. Those flags grew taller and more vibrant in color during our marriage. As it turns out, those same red flags that had been lining my path for years were dipped in a highly flammable mixture of kerosene. I realized the danger only when they exploded near the end of my marriage. Like any unexpected explosion, I was unprepared and left nursing deep, emotional, third-degree burns. In my research, I discovered a new language which took quite a bit of studying and insight on NPD to understand. As it turns out, the reason that I was so bewildered by Seth’s communication style was that we were speaking completely different languages. I spoke the English version of “human” while he was speaking the non-human “Narc-ish.” I am convinced there is a Narc-ish dictionary or manual hidden deep in a dark, musty hole somewhere in a faraway land with step-by-step instructions on how to inflict fear, confusion and despair. From this land, narcissists hail. Their secret language can only be decoded by those who aren’t fooled by the narcissist’s stealth ability to inflict confusion and chaos with it. My computer has a feature that allows me to translate most languages. However, this particular area of my life requires technology that is a bit savvier. Need is the catalyst of industry: and I was in need of a device to decipher Narc-ish. So, I invented one. I call it the “Narc Decoder” and have made life-altering good use of it. 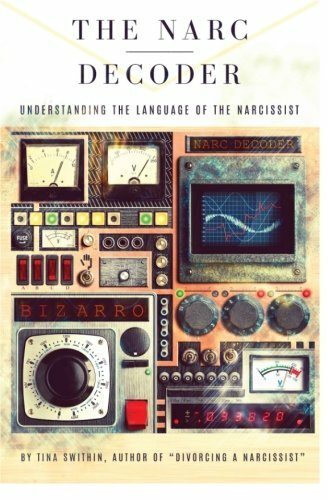 The good news is, everyone has access to the Narc Decoder because it is a machine that I am honored to replicate and share with anyone who is forced to communicate with a narcissist. Once you understand how to use the Narc Decoder, your life will change for the better. You will become empowered and will regain your voice. Over time, you will begin to find humor in the communication style that once left you on your knees begging for mercy. View More In Family Relationships. If you have any questions about this product by Tina Swithin, contact us by completing and submitting the form below. If you are looking for a specif part number, please include it with your message. Listen, Learn, Love: How to Dramatically Improve Your Relationships in 30 Days or Less!